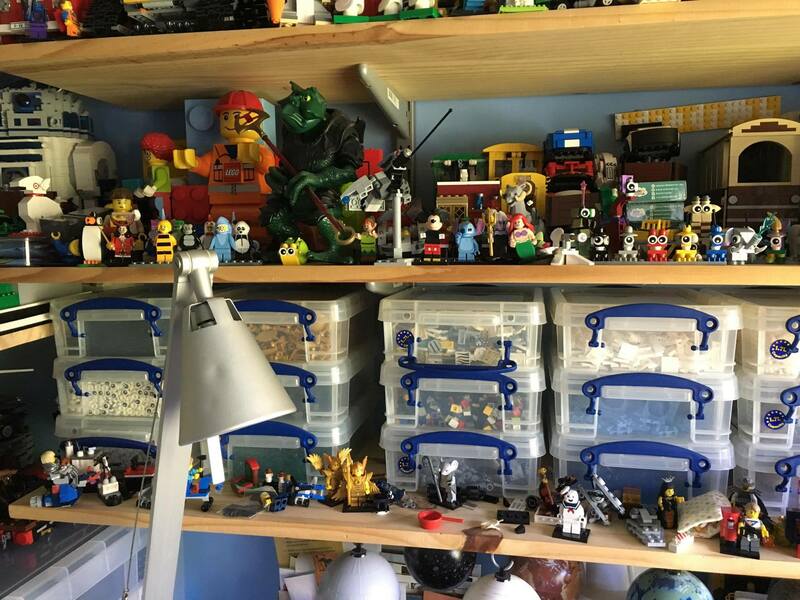 Warren Elsmore’s early days with LEGO are mostly lost in history. Neither Warren nor his parents can remember what his first set was other than it wasn’t Duplo. Showing signs of his future building talent, he does know he went straight to LEGO System and would have been around 3 years old at the time. As an adult, Warren emerged from his Dark Ages as the result of purchasing the Statue of Liberty LEGO set as a gift. 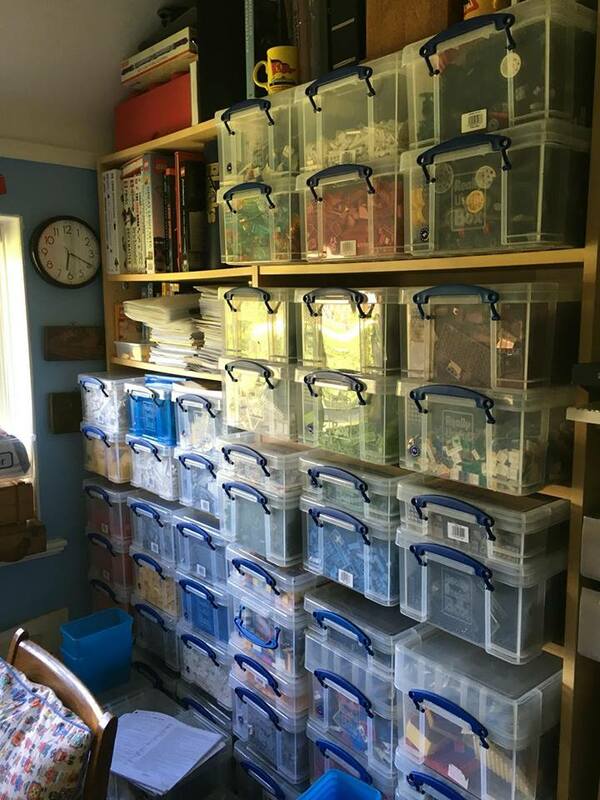 Since then, he’s gone on to become an active member of the AFOL community, a professional LEGO model builder and an author of many books on LEGO building. 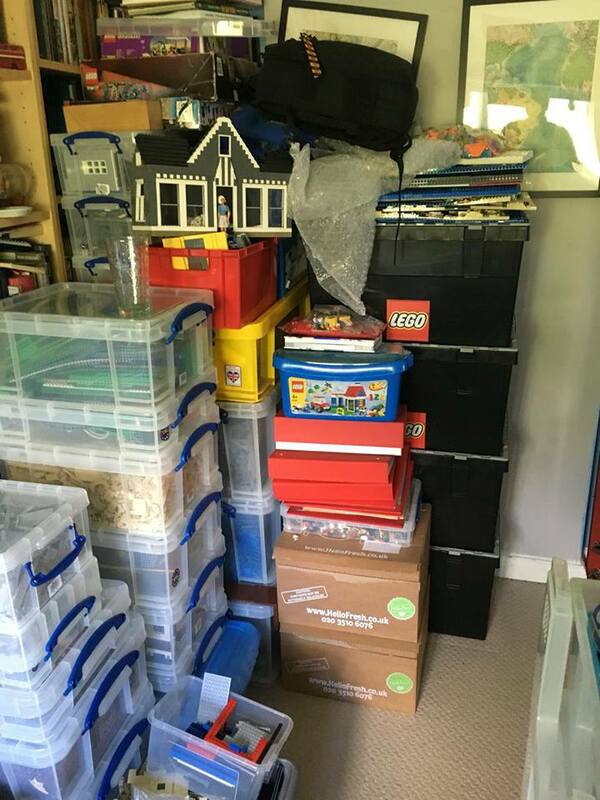 Warren is a member of Brickish and occasionally posts on Brickset and Eurobricks. His greatest love is the City theme and this is reflected in his books. One day, he’d like to build a large (10m x 10m) city layout but it may some years before it comes into fruition unless someone commissions him to create his dream. 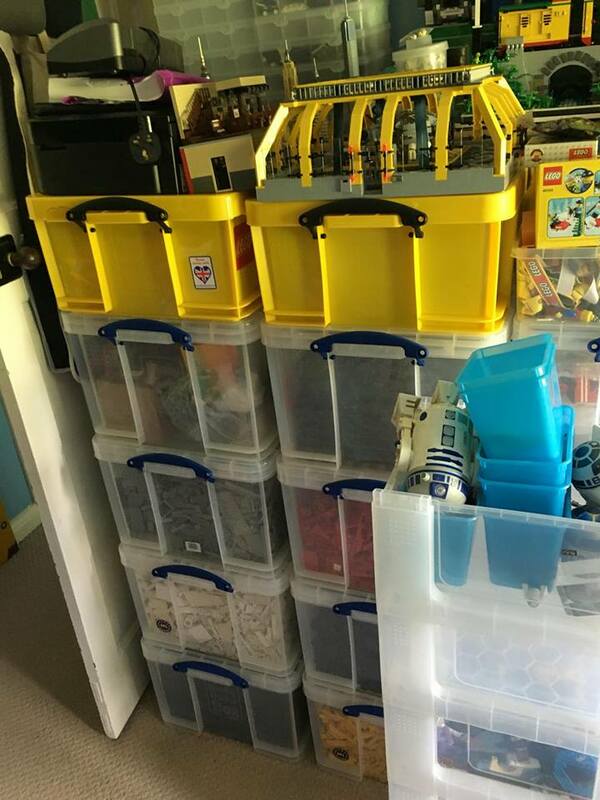 Now that Warren works in LEGO professionally, time spent looking for parts is time wasted so his LEGO storage is very well organised. 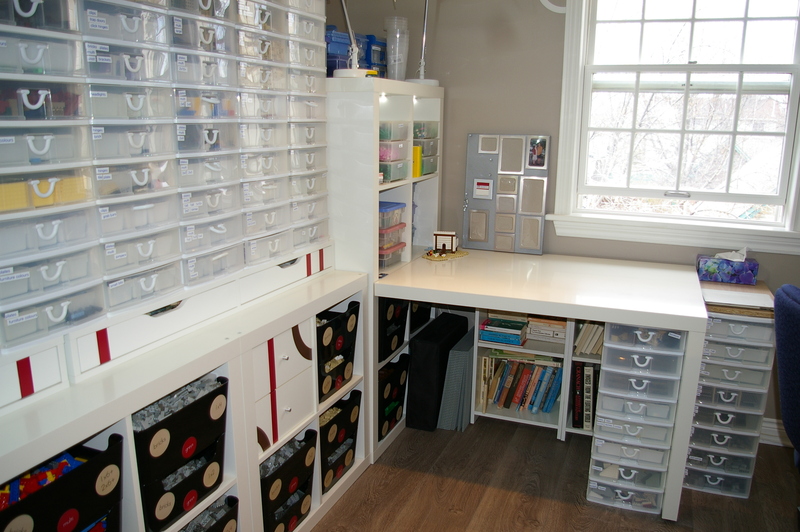 Consequently, he has spent a lot of money on his storage set up. 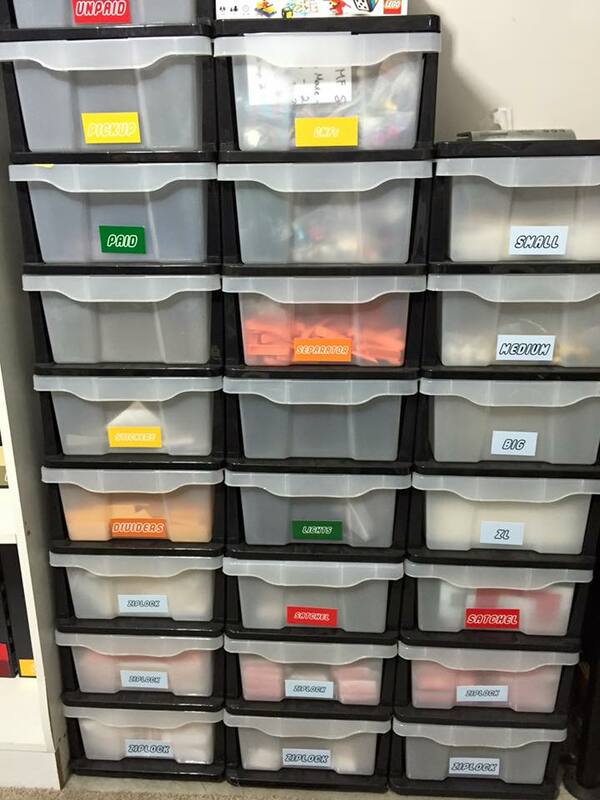 Warren and his wife Teresa categorise parts into one of around 10 top headings. 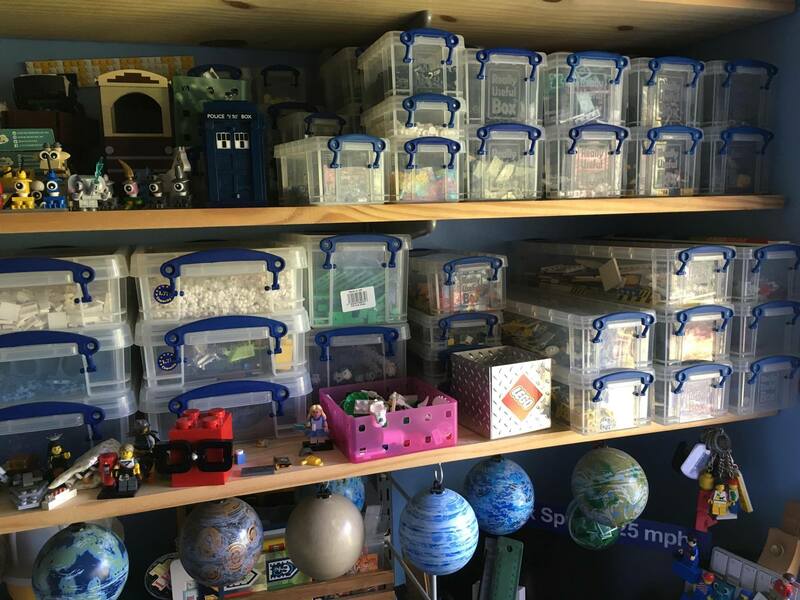 Earlier this year, they re-categorised everything int o a new storage system and it’s halved the time taken to pick parts for a model. 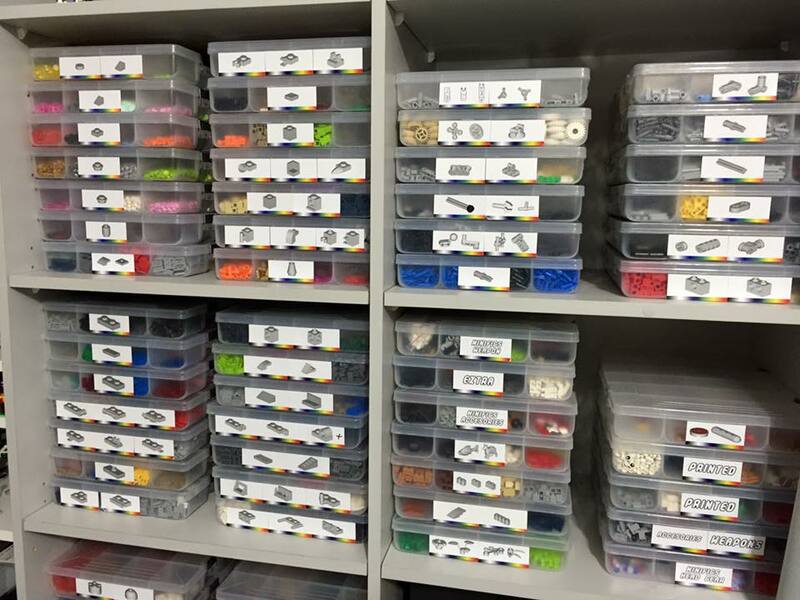 They use a hybrid of the TLG and Bricklink divisions to categorise their parts – Slopes, Clips, Bars, SNOT elements etc are their ‘top level’ categories. They then break those down, so slopes would have 25/30/33/65/70 degree slopes etc. Every element is design and colour separated, unless they have very few of a single design. 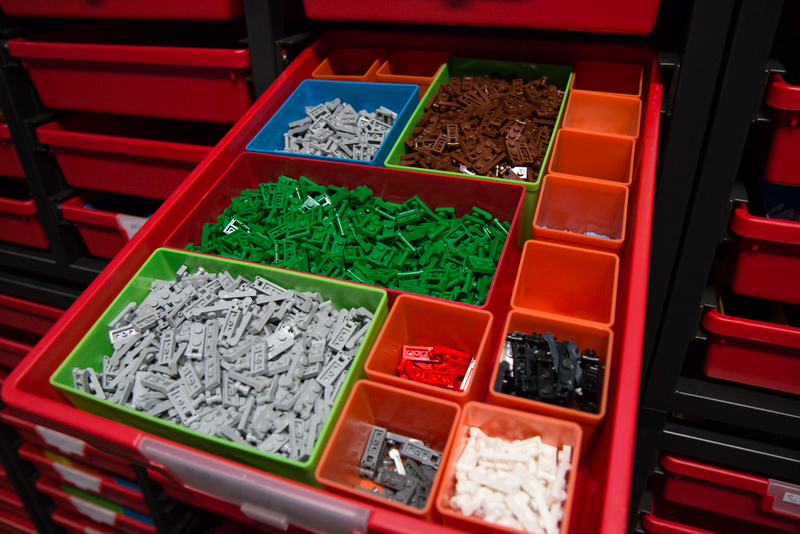 Each part/colour combo is stored in a small square plastic tub, the same as you can buy sets of screws in (Warren contacted the supplier of these in the UK and made a big order!) 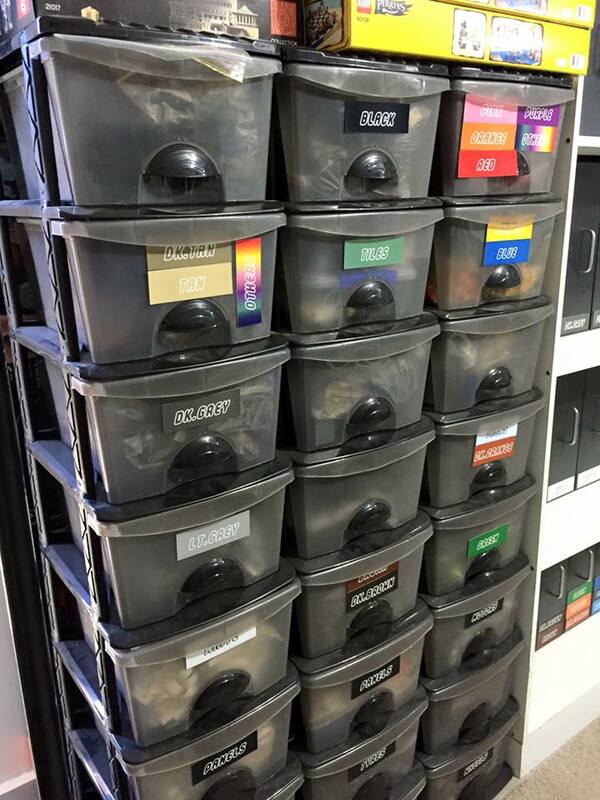 Those tubs then go into school trays, which are racked around the walls of their studio. 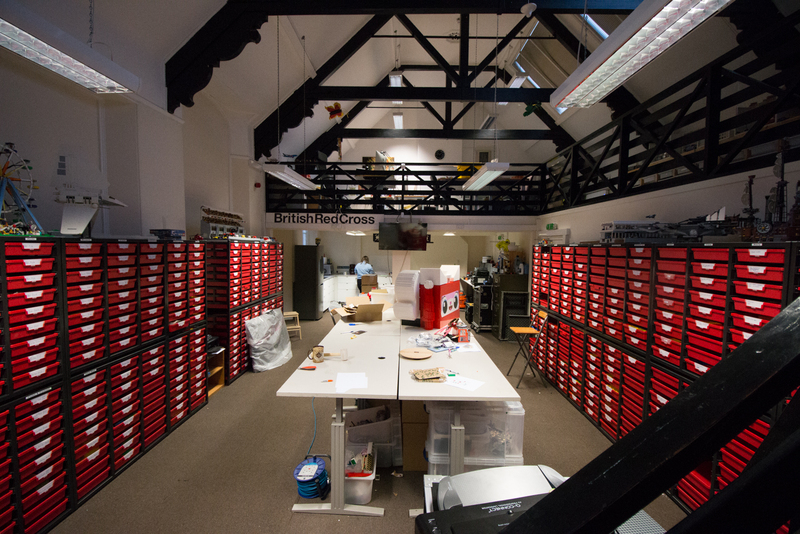 This way, they can (theoretically) go to any point in the studio, open one drawer and pick out the right part in the right colour. 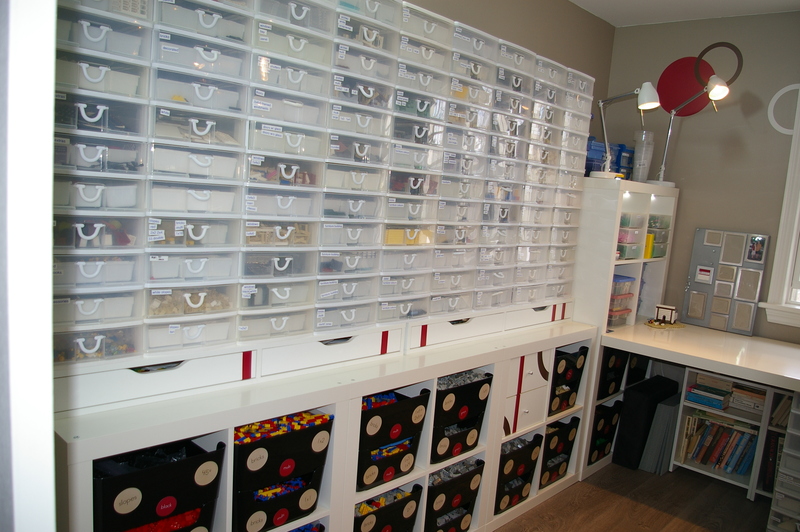 On top of this, they have the ‘bulk store’, where they keep elements for which they have a large quantity. 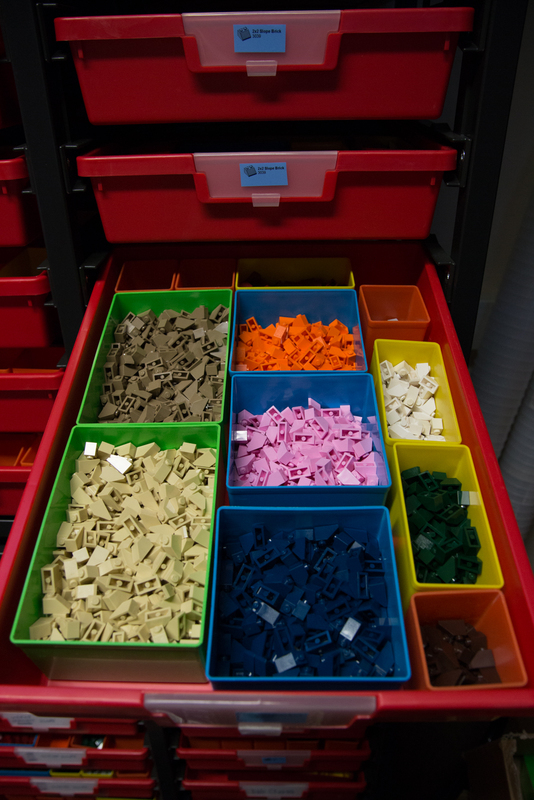 This section is stored by colour, as they tend to need ‘green plate’ rather than any particular size of green plate. All in, Warren believes they have about 4 million elements in stock at any one point of time. 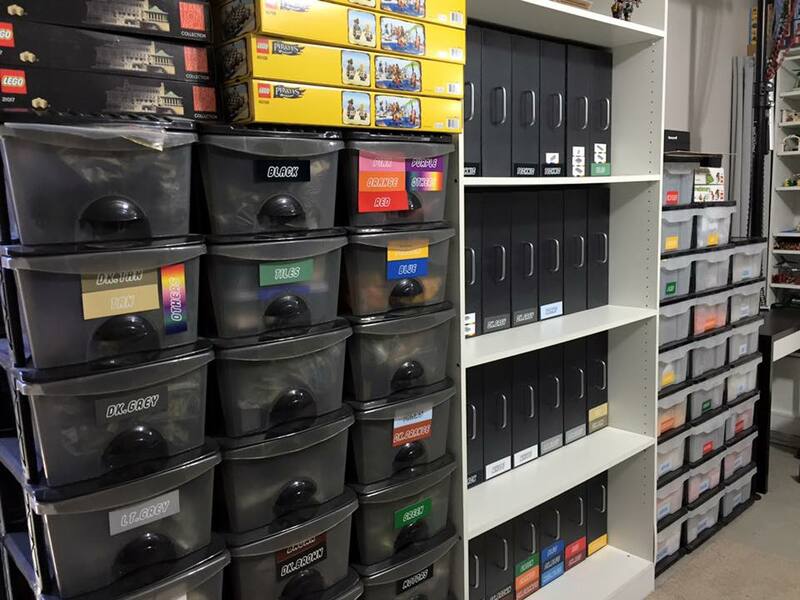 Being part of the fan community is probably the best part of being a LEGO fan for Warren. With his wife, he has been lucky enough to spend time at events throughout Europe, the US and Australia. Everyone they have met has been friendly and they all share the common language of “LEGO”. It’s even more impressive in Europe where they have ended up hanging out with people from 6 different countries, speaking 6 different languages and having a great time because of their shared love of the brick. Conversely, Warren sometimes finds the “entitled” attitude of a very, very small minority of fans ruins his love of the community. 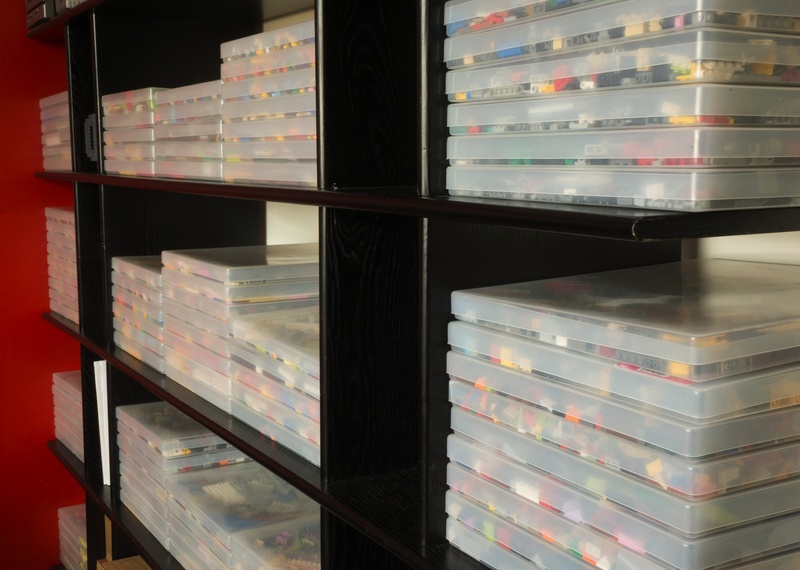 These are the people who believe The LEGO Group owes them something just because they buy a lot of LEGO. As much as he loves LEGO and makes a living from working with it, it’s still just a children’s toy. The LEGO Group is already one of the biggest toy companies out there, what more would they need from us fans? It’s Warren’s belief that however popular AFOLdom becomes, we’ll always be an edge case and he thinks we should remember that. Besides, if we could have any element in any colour, then where would the fun be? Paco from Aussie Brickster arrived in Melbourne from Mexico at the age of 19. 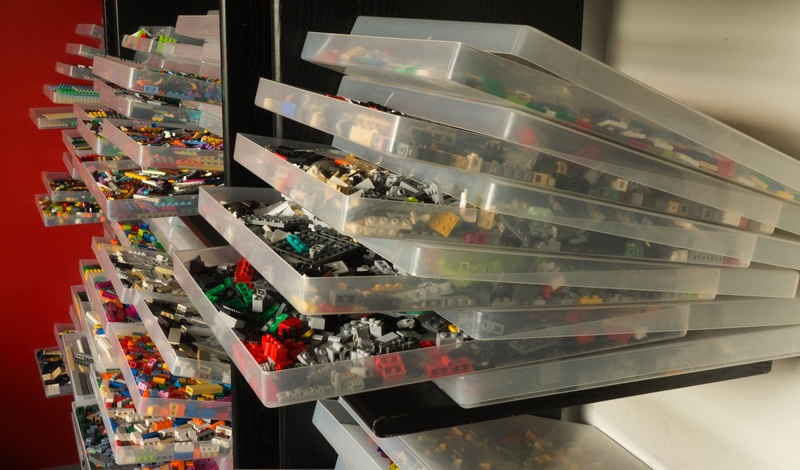 Like a lot of Adult Fans of LEGO, Paco stopped building with LEGO for a while but returned to it as an adult once he had his own children. 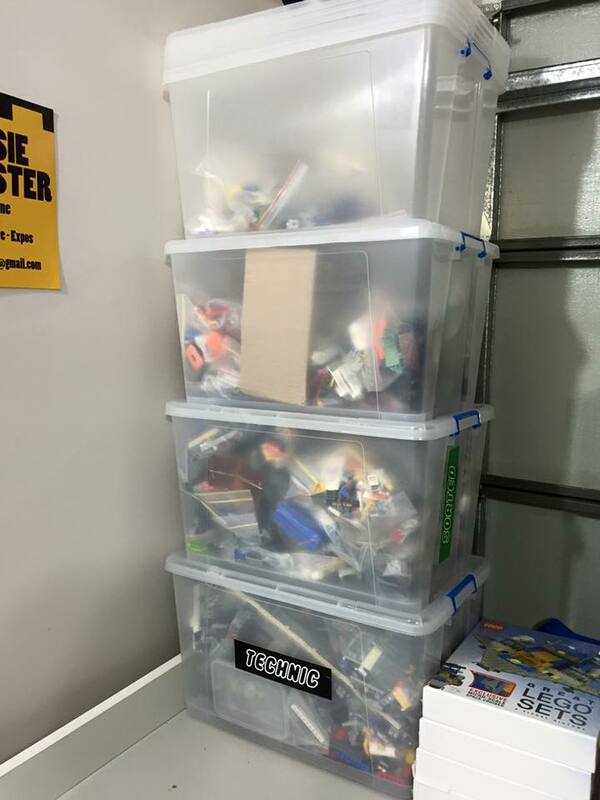 Since becoming an AFOL, he has become a member of MUGs (Melbourne LEGO User Group) and runs a popular Bricklink store. Thematically, Paco prefers themes that don’t contain many sets – such as Paradisa, Monster fighters and themed City Sets. 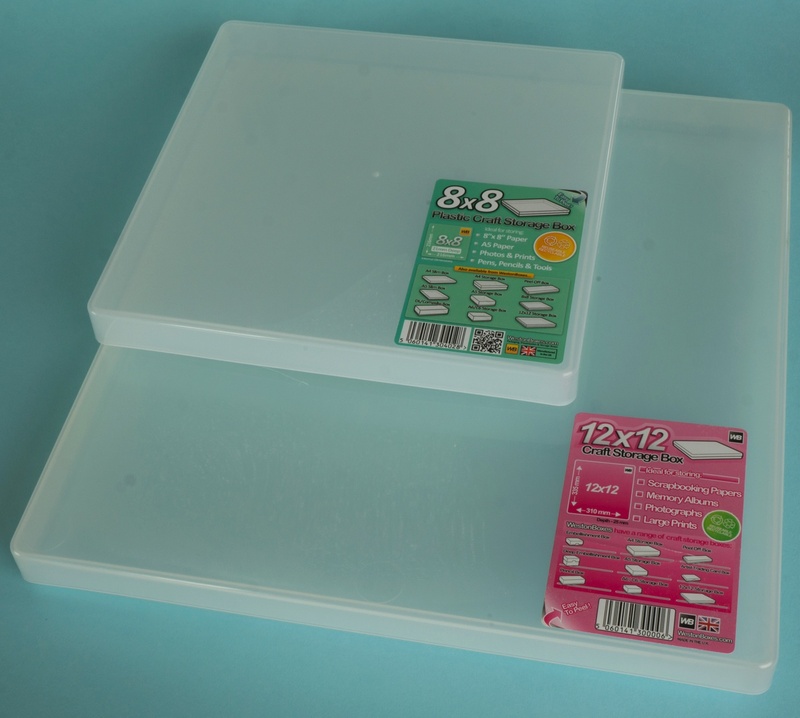 It makes it a lot easier to use them to create a great looking diorama without having to spend 1000s of dollars to buy the necessary sets. 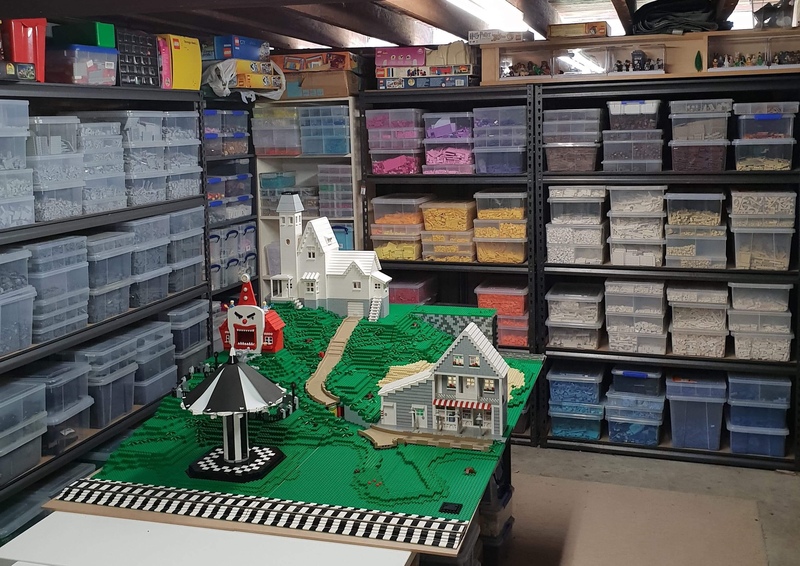 He tries to build large dioramas so he can encourage other LEGO fans to try to do the same thing. 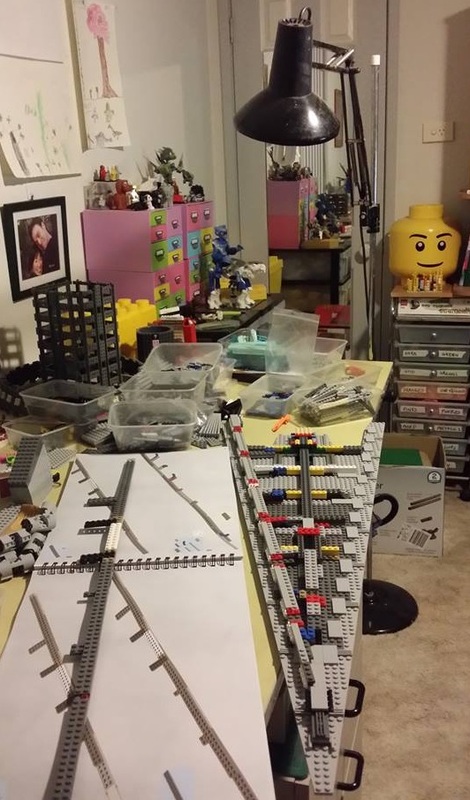 His belief is that if he shows that he can produce something large then other LEGO fans will try to do the same thing. He usually starts with the regular sets and then builds on the details to enhance the series and produce a decent diorama. 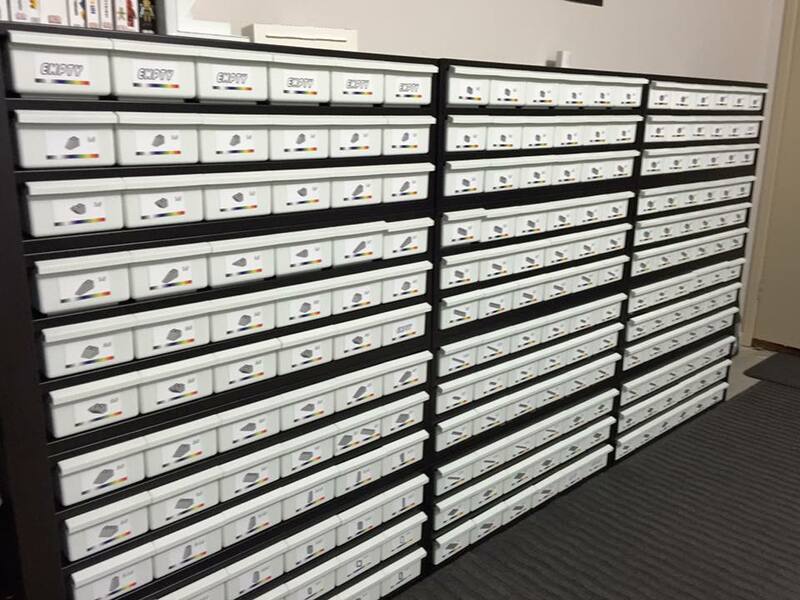 Storage options for Paco are all about consistency and efficiency. 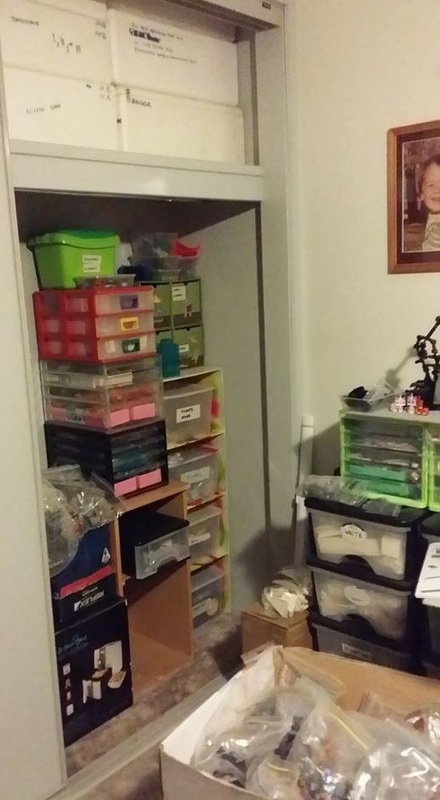 His preference is for matching storage solutions and he will regularly change his set up if he can’t locate an adequate number of a particular system. 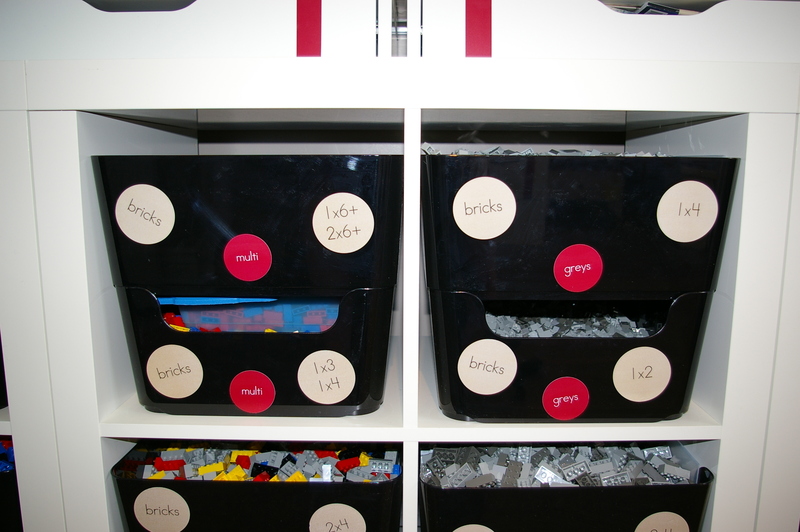 His parts are organized by type with labels to allow for easy location. 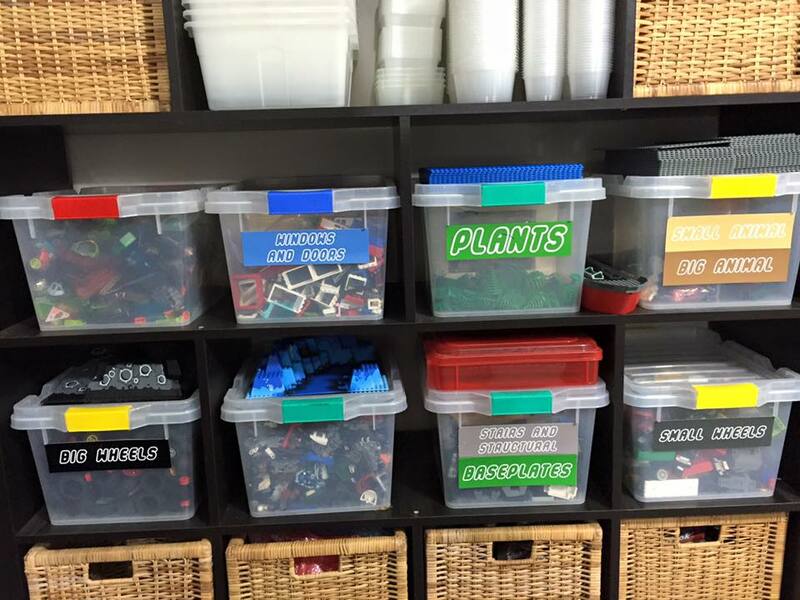 Since these photos were taken, Paco has redesigned and rearranged his LEGO storage. Being a LEGO fan is very relaxing for Paco. 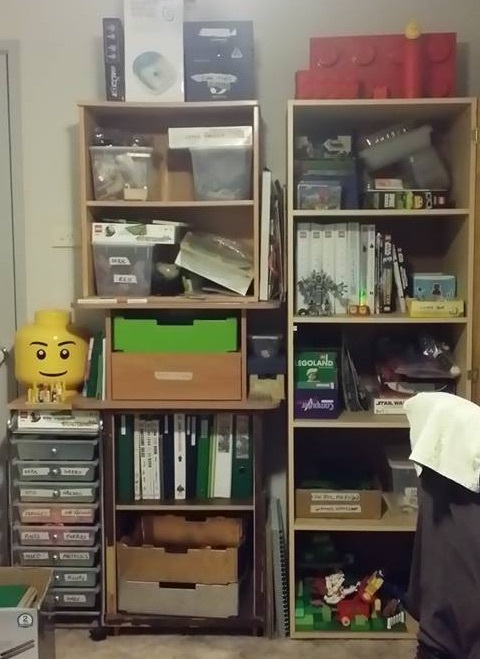 He loves sorting, fixing, building and creating. It all helps him deal with some of his personal issues. Sourcing parts can be frustrating though. 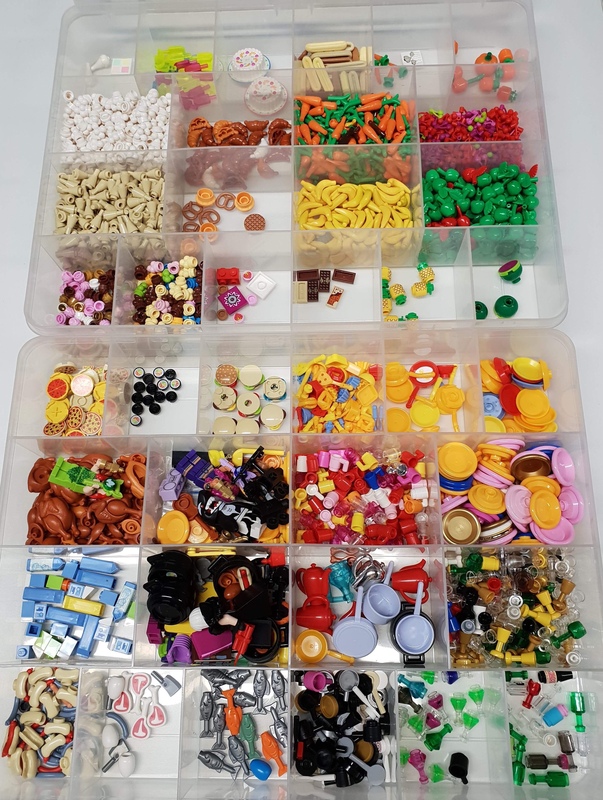 Despite having his own personal 24/7 Bricklink store he finds it rather annoying to have an idea and to not have immediate access to the correct pieces in order to bring his creation to life.